A social insect classified under the order Hymenoptera. They are one of the more evolved group of insects. In the UK the most common species found are the German Wasp Vespula germanica the Common Wasp Vespula vulgaris. Large, conspicuous buzzing insects with yellow and black striped, wasp-waisted bodies, which are 10-15mm long. They have a sweet tooth at one end and a painful sting at the other. 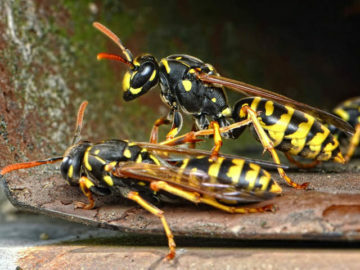 Normally wasps will eat other insects, acting as natural pest controllers. However during peak season, usually in August and September, when they nurture their young, the workers will feed on sweeter, usually fermenting fruit. During this period they become a nuisance as they give the appearance of being ‘drunk’. Common throughout Britain and Northern Europe. 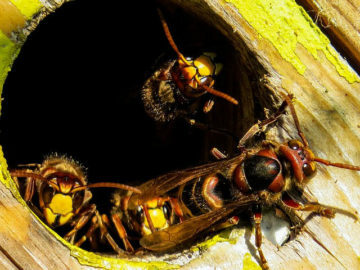 The common wasp and german wasp are social insects that form colonies inside nests specially constructed in soil banks, roof spaces and vacities in trees and walls. They are frequently associated with domestic housing. Treating a wasp nest can be very dangerous. Any disturbance caused to the nest will make the wasps feel threatened and thus aggressive. At this stage it is likely they will sting. We always recommend that one of our trained technicians treat the nest. They will have all necessary equipment, personal protection equipment and professional insecticide. Whenever possible our trained technician will apply an insecticidal powder directly into the nest. When the nest cannot be reached, we will apply the powder to the entry point. As the workers fly in and out they spread the powder into the nest. We always recommend staying away from a treated nest for at least 24 hours. The wasps will behave aggressively during this period since we have just threatened them as well as the way the insecticide works. Please note that water, such as rain, can wash away our powder and thus make the treatment ineffective. Should you still have activity after 24 hours following our visit then please get in touch. We use a range of products for wasp control. If you are concerned about any of them, please click the relevant link below to download the relevant safety data sheet or get in touch. If you think you have hornets, get in touch, the treatment procedure is the same as wasp control. 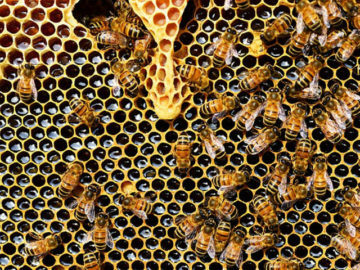 Most bees can be relocated if they are an issue. With their declining numbers it is our policy not to kill bees. If you think you have a problem with bees, speak to our team, we’d be more than happy to help. 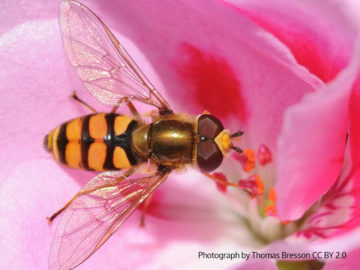 The hoverfly is easily confused for a wasp or bee due to their similar colouring and markings. Hoverflies are completely harmless. If you are not sure if the you have a pest problem, contact our pest control team, we’re always happy to advise.